At Beetham Dentistry, we are happy to offer dentures to our patients. Dental Implant Supported Dentures have been gaining popularity recently. This style of dentures has helped many people replace their missing teeth and live in relative comfort while being able to maintain all the looks and functionality of the teeth that they once had. Here is some information about Dental Implant Supported Dentures to help you understand how they can benefit your dental health. 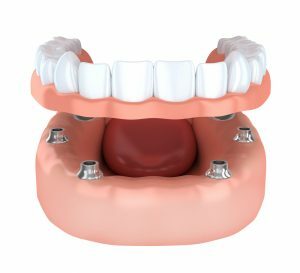 What are Dental Implant Supported Dentures? These are types of dentures are supported by and attached to implants. Regular dentures simply rest on top of the gums and cannot be attached. Implant-supported dentures, on the other hand, are attached to the mouth. They are given to people who don’t have teeth in the jaw but still have enough bone to support an implant. These dentures will snap into place with attachments that are fixed to the implants. Generally, these types of dentures are used only for the lower jaw, as that is generally where someone will need more stability. In certain cases, however, implant-supported dentures can be affixed to the upper jaw, especially if regular dentures don’t prove to be working. Dentures can come in complete or partial sets, depending on how many teeth you are missing. Bar-retained Dentures – these dentures contain a metal bar that follows along the curve of your jawline. They usually span two to five implants that have been surgically placed into your jawbone. The bar will be affixed with attachments that allow the denture to be clipped securely onto it, making for a stable smile. Ball-retained Dentures – Ball-shaped attachments will be fixed into sockets that are on the denture. Each jaw implant will hold one of these attachments, and then a matching attachment will line up with these on the denture, which allows the dentures to be easily snapped into the jaw. There are several reasons that one may choose to have implant-supported dentures, as opposed to standard dentures. Below are some of the advantages of supported dentures that may prove to be beneficial to you based on your personal needs. Greater Stability – Because these dentures don’t just rest on the gums, they provide a lot more stability. They can be snapped into place, which allows for a stronger hold within the mouth, which greatly reduces the chances of the dentures being disturbed during eating or talking. Easy to care for – because these dentures can be easily snapped into and out of the mouth, you can care for them rather easily. You can brush your teeth as normal while the dentures are in your mouth and get to some of the more difficult parts by taking the dentures out. Easier to Eat – with the stability of your supported dentures, you’ll be able to eat foods that you may not have been able to with standard dentures. If you have any questions about dentures or would like to schedule an examination to see if you could benefit from them, feel free to contact us today at (425) 825-8800.